If you’ve been wondering how do I stop eating at work, here are some very simple steps you can follow to stop eating at your desk starting today. It’s easy to gain control over what you do at work once you know how, so read on. This tip may be super obvious, and it may sound impractical, but my advice to you is to always eat nourishing meals, and don’t eat food in between meals—except maybe once or twice a day. Forget sandwiches. Inform your management, if you must, that from now on you’re going to take at least a 20-minute break at lunch away from your desk. Take the time to eat and chew and enjoy your food. Make sure you eat plenty of delicious food with enough protein. Drink water at least one hour after lunch, but drink all day long. This will make you a more efficient worker because it will improve your health and help prevent migraines. This will also give you an excuse to leave your desk to go to the bathroom—and short breaks will boost your productivity. Ban coffee! 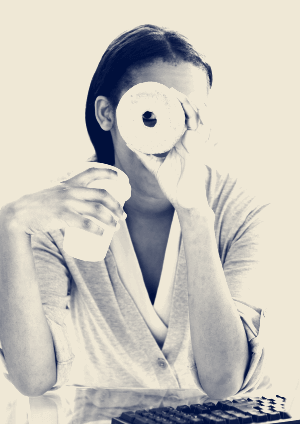 People usually drink way too much sugar with coffee, and it may trigger a sweet tooth response. If you suffer from emotional eating, the tips above will probably not be enough to help you stop. 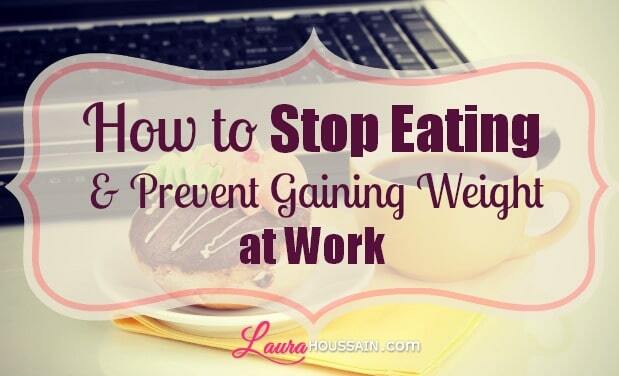 The tips below will show you how to stop stress eating at work or eating out of boredom. There are several things you can do to reduce your desire for food at work. To do that, you can follow the steps I’ve described for how to stop stress eating, such as exercising several times a week, and practicing meditation daily. I give more instructions in my article on how to stop stress eating. If you think that you eat out of boredom, you can also follow the steps for how to stop boredom eating. Create an affirmation that you will mentally repeat as needed to unlearn the habit of eating mindlessly at work. For example: “I eat only during meals”. Create a mind movie of the ideal work day you want to have. Imagine yourself being vibrantly healthy, present, in control, and enjoying your day. Play your mind movie at night just before falling asleep and in the morning before getting up. You can use the power of habit for you instead of against you. For example, I try to make it a point to eat at a table and not to do anything else other than eating when I am eating. This ritual will make you mentally associate eating with a place other than your desk during work hours. It’s very simple, but if you use this ritual consistently, over time it can become extremely powerful. three deep breaths and scan your body for tension; listen to your thoughts and emotions. Drink a glass of water if you feel like it. If you need to, say your affirmation or something that gives you a sense of joy, fulfillment, and power. Create a mental movie of the worst that could happen if you keep on eating at work. What shows up? Is it extra weight, diabetes, rotten teeth? What is the negative consequence that really gets you? Once you have picked one deep fear, create a vivid mind movie of how it will physically feel and look like in the future, and bring it back to the present. Let me give you an example. Let’s pick “rotten teeth” as your biggest fear. Now, sitting at your desk, imagine that as your hand is reaching for the food cavities are beginning to form, and as you’re bringing food toward your mouth, your teeth start breaking or falling off one after the other. Do not reach for food. Do the whole process mentally. I can assure you that if you make this mind movie as real as possible and you play it mentally, you won’t feel like snacking at your desk again. That single technique can bring you to stop eating at work. If you can’t do this technique at work, do it at home; just imagine you are at your desk and make your emotions as intense as possible. Play that mind movie each time you feel like snacking at your desk. It will help you greatly. The trick is to make the fear as intense as possible when you do. Then, once you have done that, drink a glass of water. I think many emotional eaters have issues with saying no to others and setting healthy boundaries. The work environment can be hard on emotional eaters. They end up saying yes to too many assignments and putting too much pressure on their shoulders. In that case, you’ll have to learn to say no with confidence. “I can do this but this I can’t do it for today.” It may take a while and several jobs for you to learn how to do this but it will reduce your levels of stress, boost your self-esteem, and make your job much more pleasant. You put yourself up for failure if you impose too many tasks on yourself at once. It may disturb your sleep, harm your relationships, hurt your self-confidence, and give you a bad reputation as someone who can’t meet deadlines. Sensible managers will listen to your feedback. I know some jobs are less than ideal, but do your best to stand up for yourself. If you don’t, you may end up falling back on the only solution you know—munching on food mindlessly and adding up unpaid extra hours. When you do this, you’re basically telling your unconscious that your work is not worth being paid the salary that you have. If you can relate to this situation, learn to set new goals and stick to them. Practice saying no outside of work first, if you must, but learn to set boundaries. If you feel that being at work is a huge trigger for compulsive eating, maybe you have some beliefs that need to be addressed. The techniques in this article will help you stop emotional, stress or boredom eating at work. If you address the beliefs that are triggering irresistible cravings, eventually you will no longer have to use any technique. You’ll come to work feeling at ease and energized. Let me give you an example. If you suffer from low self-esteem and you think your work has little value, you may be tempted to work overtime to compensate for the lack of credit you give to your work. It will be almost impossible to set boundaries. You’ll end up being pushed around by your co-workers who’ll be more than glad to transfer some of their workload to you. This will cause a lot of stress and resentment that you may be tempted to relieve with comfort eating. But if you increase your value and the value of your work internally, your behavior will change. You won’t let your co-workers push you around or take on extra hours. You won’t need food to support and comfort you because you’ll be the one doing the supporting. You’ll be supporting yourself. I think it’s a much more rewarding alternative. Addressing your hidden beliefs on your own is hard. I give you instructions on how to do so in my article about setting goals. Sometimes, however, you may need the help of a practitioner like myself. With me, you’ll be able to address the core issues that have pushed you to use food as a compensation. But, as you can see, there are many things you can do on your own to stop eating mindlessly at work. Start with one or two techniques and give yourself thirty days. Be consistent, and your snacking days at work will soon be over. If you want more tips like these subscribe to my newsletter below. I’ll be sending you more tips, strategies, and techniques you can use to change your life and your looks today. I have scanned a ton of articles on this and some have the worst advice: “Go see a movie.” Ummm I’m at work. I obviously can’t do that. This is the first one that is actually helpful! I love the mind movie tip, and the one about visualizing your fears about eating. I know that kind of advice: go see a movie, walk your dog, take a bath… As if we could do this all day. I’m glad you’ve found my tips helpful. I like giving tips and techniques you can use in the moment and that take as little time as possible. Please, let me know what kind of results you’re getting with the mind movie one.